Greetings from the West Coast. I made it to California on Sunday and have spent the last few days getting settled and doing some exploring of the area. I gotta say, Michigan this place is NOT. It’s sooooo different in so many ways. The first most obvious difference is the climate. It’s the beginning of September which for Michigan would mean that very soon (if not already)the temperature would begin to drop and give way to autumn. We also see our fair share of rain in the Mitten. Well, I may have only been here three and a half days but I’ve checked the forecast for the next 10 and so far The Weather Channel says that there’s nothing but sunny skies ahead with the temperature in the upper 70’s and 80’s. The ‘heat’ here is even different. You feel it, but unlike in Michigan, Calif heat as I’ve experienced it isn’t oppressive/humid/muggy. There’s usually a breeze that comes up to temper the heat from the sun. It’s nice. The city I’m living in was literally built in the middle of a desert valley, so at any moment, in just about any place you’re at, you can look off in the distance and see the tall, rolling mountains surrounding you. This may seem commonplace and un-extraordinary if you’re used to it, but I’m not, so I think it’s pretty awesome and beautiful. Perhaps most importantly…OMG, there are SO many different restaurants/food options out here! Back where I’m from in Michigan we really only had a handful of independently owned restaurants/joints besides the major chains. Not the case out here. I’ve had to add the Yelp app back onto my phone just to be able to pinpoint the highest rated places around where we are (and there are plenty). I’m excited to be able to try them out on the days when I don’t cook and/or have leftovers in the fridge. As for today’s post, this is actually a recipe that I made a couple weeks before I made the big move. I figured that I would be busy both right before I left and that I would also need some time to get settled in the new spot before I made my first meal in the new apartment and tried to put together new photoshoots and posts. My instincts were correct and although I plan to start cooking in the new spot tomorrow, I do have several back-up posts ready to share just in case I don’t get to take pics and write up recipes. An icebox ‘cake’ is probably the easiest type of cake to make there is (even easier than a box cake mix), since in most cases there is no baking involved at all. Really all it involves is the layering of cookies, ladyfingers, biscuits or pre-made cake in between whipped cream/custard or some other kind of filling. The mixture is allowed to rest overnight in the fridge and the filling softens the base carbs so that they become soft and chewy; like a ‘cake’. It’s a stupid easy technique that can result in stupid delicious results. Like this one I’ve made for you guys today. If you’re new to icebox cakes, then let me make a staunch recommendation to you: start with a chocolate chip cookie one. Why? Well #1, everyone loves chocolate chip cookies. Ev-ery-one. And if they don’t, well…maybe you shouldn’t know them. 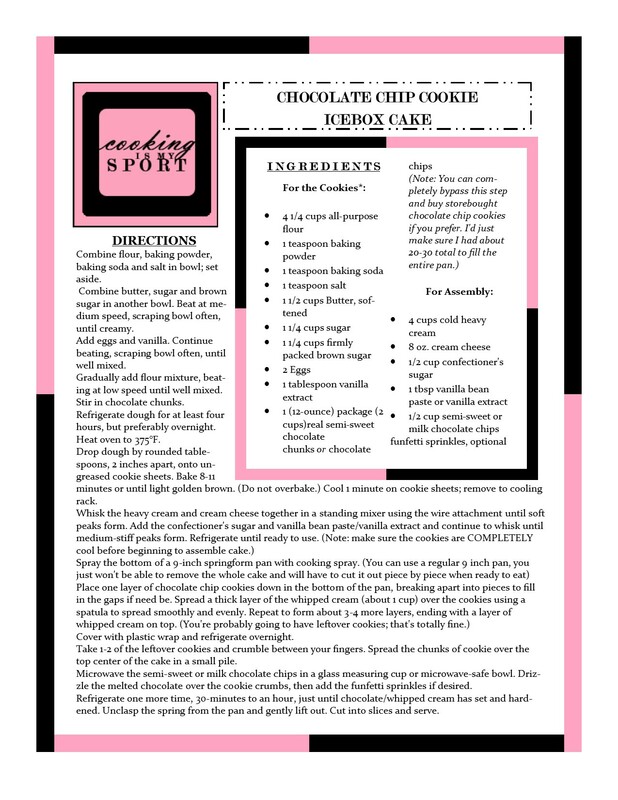 Number #2, this chocolate chip cookie recipe that I use is extremely simple to follow and tastes delicious; however, it’s also perfectly fine to use store-bought ones if you’re not in the mood for baking them beforehand. And CCCs are something that can be found in just about any grocery store. The flavors here are no-frills and pretty up front; chocolate chip cookies are sandwiched between layers of vanilla flavored whipped cream,then topped with more whipped cream, melted chocolate, sprinkles and crumbled chocolate chip cookies. Guys. I mean…need I say more? Just *look* at it, will you? And yes, I guarantee it tastes every bit as delicious as it looks. Happy Fiesta Friday #136, where I’ll be sharing this cake co-hosted this week by Judi @ CookingWithAuntJuJu. Combine flour, baking powder, baking soda and salt in bowl; set aside. Combine butter, sugar and brown sugar in another bowl. Beat at medium speed, scraping bowl often, until creamy. Add eggs and vanilla. Continue beating, scraping bowl often, until well mixed. Gradually add flour mixture, beating at low speed until well mixed. Stir in chocolate chunks. Refrigerate dough for at least four hours, but preferably overnight. Drop dough by rounded tablespoons, 2 inches apart, onto ungreased cookie sheets. Bake 8-11 minutes or until light golden brown. (Do not overbake.) Cool 1 minute on cookie sheets; remove to cooling rack. Take 1-2 of the leftover cookies and crumble between your fingers. Spread the chunks of cookie over the top center of the cake in a small pile. Microwave the semi-sweet or milk chocolate chips in a glass measuring cup or microwave-safe bowl. Drizzle the melted chocolate over the cookie crumbs, then add the funfetti sprinkles if desired. Refrigerate one more time, 30-minutes to an hour, just until chocolate/whipped cream has set and hardened. Unclasp the spring from the pan and gently lift out. Cut into slices and serve. This looks so amazing! I love everything in it. Wish I had some right now (even though it’s only 10:00 in the morning)! 🙂 Best wishes on getting settled in your new place! My sister lives in CA, and we sure love visiting her there. It’s such a beautiful place! Fridge cakes are among my favourite desserts to make because they don’t involve cooking and because it is so easy to switch up ingredients and try something new. Congratulations on the smooth move. It sounds like you are loving your new environment. Happy exploring and taste testing! I agree Laura; there’s so many different flavor combinations that can come with icebox cake, but sometimes the most simple combo is the best. Thank you! Thank you very much ma’am! This is my first time setting foot in California after a lifetime in Michigan so I really like what I’m seeing here. Have a great weekend! Welcome to Cali, Jess! Where I’m at we are still in the 80’s to low 90’s this week. Still shorts season. Your icebox cake looks so tempting! Congrats on your move! I love your blog & photos! Would you mind if I reblog this post? This is a very beautiful place,Loretta. I gotta say, I DO think I’ll miss Michigan autumns though, as Michigan becomes an equally beautiful place in the autumn. And, not having snow at Christmas will take some getting used to. Thank you, have a great rest of the weekend! Here’s a blog post from Jess(ica) over at her fabulous blog http://www.Cookingismysport.com. Enjoy! Posted	 September 10, 2016 at 4:14 pm by Amber R. Yay!! So happy you made it safe and sound 🙂 Great recipe, too. I could use a slice in this oppressive South Florida heat! It’s a REALLY good dessert for a hot day Amber; thank you! I’ve heard from my fam back in the Mitten that the weather hasn’t been so nice. So sorry! Thank you Heather! I’m glad you made it Jess! It sounds to me like you’re going to enjoy your new city. This icebox cake looks seriously delicious and perfect for a party. It’s just beautiful. Keep us posted on your new city and experiences. I’m usually not a fan of icebox cakes, but when I saw how deliciously messy this one is, I couldn’t help but put it on my to-do list! I’ve also always wanted to visit the west coast, but I’ve never gotten around to it. Congrats on your move, Jess. This cake seems very festive and decadent and wonderful — I plan to try it soon!